Fog hung in the cool air over the Kaministiquia River, shrinking the world into a few hundred feet and transforming the banks into shadows. Wim and Dan stood nearby and watched me pack the boat. I sorted equipment and food into hatches, trying to fit three weeks of supplies into the thin holds. I shoved in bags of granola, pasta, dried fruit, oatmeal, jerky, and summer sausage along side jars of peanut butter and bottles of fuel. I felt the weight of each in my hands and thought of fighting up the Kaministiquia and Dog rivers, of finding a way past the impassible Prairie, du Milieu, and Savanne portages, of crossing Quetico’s lakes and rivers from one end to the other, and reaching Rainy Lake and International Falls. It seemed to take forever, shoving and stacking bag after bag, squeezing the air out of each, making them fit like a puzzle until I filled every inch of the boat and still worried I didn’t have enough. Dan and Wim stood and watched, waiting in the cold fog, patient, knowing they couldn’t help, that packing a boat is something personal, something only I could do. For three days they’d done everything they could to get me ready. We found dotted trail lines on old maps and followed the route across them. We scoured aerial photos and visited friends who might know where to pick up the portages or if they even existed anymore. We searched for clues in old books and traced the words onto maps. Now I only had to go and see if any of it was still there. We lifted the boat to the water’s edge and I got inside, cramming my body in with all the gear. They stood on the dock and waived goodbye. I thought of Isle Royale a year ago and how lucky I am. I turned and raised my hand one last time before the fog swallowed me away. Their engine turned and disappeared and I felt alone on a black tongue of water racing through the fog. The shores became shadows of banks and trees. 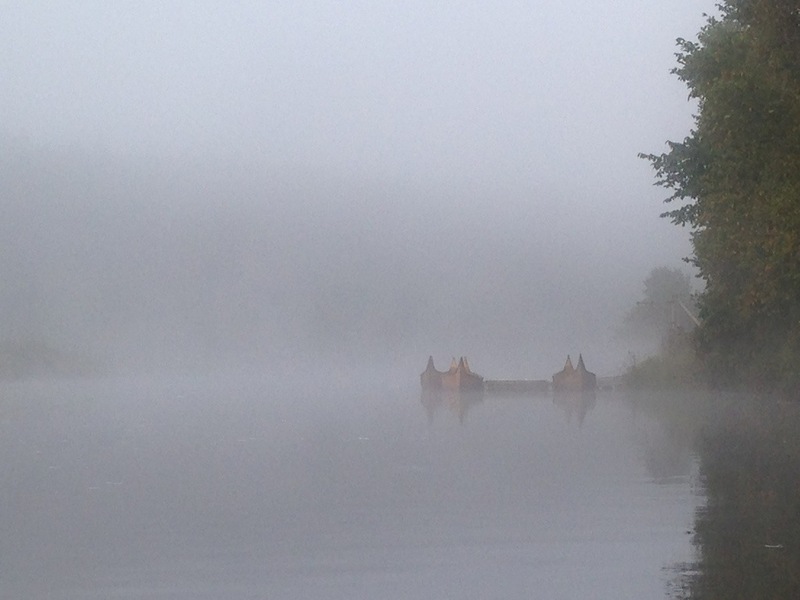 I paddled, peering into the mist, watching the river appear and fade away. Then I saw the shadow of a voyageur’s canoe emerging like a ghost from the fog. Three of them hung off an old dock. Their crescent ends curved upward. Their birchbark hulls spread wide enough for eight men and three thousand pounds of gear. They were all I could see, those ghosts and the shadow of Fort Williams’s palisade rising behind them. I stared as if lost in time, waiting to hear the voices of men loading goods, packing barrels and crates, shouldering stacks of blankets for the interior, but there was only silence, only the quiet rush of water swirling underneath my hull, bits of foam spinning off from some distant, waiting rapid. Over, under, around, or through, I told myself. I will find a way. Posted in Angle to Key WestTagged Angle to Key West, fort Williams, friends, Kam-dog, Kaministiquia Route, VoyageursBookmark the permalink. I love your reflections and descriptions….good luck; I’ll be following each post!